The City recently announced a six million dollar surprise surplus. What do you think the money should be spent on? What did you do during last Friday’s storm? Do you think the State should lift water restrictions after the deluge we’ve had this winter? We would like to have an idea of our demographics – age wise. Please let us know your age range…we really appreciate it! 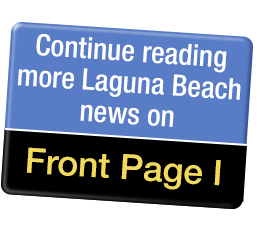 What new kind of sit-down restaurant would you like to see in Laguna? This week marks the start of the Waterwise Challenge. Laguna Beach has won three times. Will you be going to www.mywaterpledge.com to make your pledge to save water? What do you think of the new smoking ban? Will you support an undergrounding bond if it shows up on your November ballot? Should the iconic pepper tree be removed from its City Hall site? Which trolley system do you prefer? Do you think the proposal to turn the area near the Library between Glennerye and Coast Highway into Park Plaza – a pedestrian park – is a good idea? *What is this Park Plaza of which you speak? Should “Granny flats” (accessory dwelling units) be allowed on lots of 5,000 square feet and up?